If you received your point cloud registration results and wonder why they don't look perfect, this page may help diagnose the problem and give you some guidance on how to collect better data. Sun glare occurs when the sun shines directly or is reflected into the lidar while collecting data. You won't see this problem on overcast days for obvious reasons. You can resolve this by either collecting data when the sun is not intense or by manually removing these points from the point cloud. They are fairly easy to identify and remove. To minimize this drift, you can change the data collection method to overlap areas sooner, or avoid overlapping the area altogether. If the total drift between scan sightings is less than a quarter meter or so, Kaarta's algorithms will close the gap automatically to prevent the double registration, but does not back-correct the data. This prevents the drift from propagating and limits the overall error due to drift. Kaarta is working on a tool that can correct for drift, including instantaneous twists as well as address pointclouds that were collected with different start and stopping locations. If you are interested in collecting datasets over longer distances, Kaarta sells Stencil which improves drift to around 0.2% of distance travelled without overlapping trajectories. the lidar is tipped more than 45 degrees from horizontal and the drone moves in a direction tangential to the scanning planes of the lidar. The first picture on the left is from a downward looking lidar with few lidar returns from the ground due to height. The second picture on the left is from an aerial platform with a highly pitched lidar sensor with more ground returns, but the area is fairly flat. Sometimes these look entirely spherical. Some of our most interesting artwork comes from scans like these. Kaarta's algorithms work best on aerial platforms when the lidar is horizontal, the flight is smooth, less than 9 meters (30 feet) high, and most of the horizontal field of view is not occluded to minimize the amount of vertical drift. Stencil with a camera can collect data and generate fully registered point clouds even a high tilt angles. This is caused when the scanner is rotated more than 30 degrees/second. The problem is exacerbated when the scanner is tilted while being rotated. The more the scanner is tilted, the slower you need to rotate to allow the algorithms to register the scan correctly. The wall at the bottom of the point cloud is reflected into the scanner through the reflective surface in the middle and registered incorrectly at the top of the point cloud since the scanner cannot distinguish between in-line and reflected data. This creates a problem during the registration process if there is a room on the other side of the wall where the reflection is shown, as the algorithms will try to match the actual scan data from that room with the reflection from the other room. This can be cleaned up by manually removing the reflected points and merging a second pointcloud of the other room into the first scan after cleaning it up. The limited vertical field of view of the Velodyne 16 and 32-line 3D lidars work very well in outdoor and large indoor spaces. They do not do as well in tight quarters. The modeling technology in our products and online SaaS processing relies on laser scan matching to achieve its high level of accuracy but every modeling system has limitations. In particular, these approaches have difficulties handling extruded environments. In smaller rooms, tunnels, sewers, and hallways are constrained in two axes, but are unconstrained along the third axis (see diagram on the left side below the figure). What this means is that smaller rooms, tunnels, stairwells, and narrow hallways have constraints in two axis, but are unconstrained along the third axis. This causes incorrect registration resulting in shortening, lengthening and twisting. The small rooms look more like extruded sections, where they are constrained in two axis, but show a lot of drift along the third axis due to too little unique 3D structure for matching. As an example, see the figure to the left. 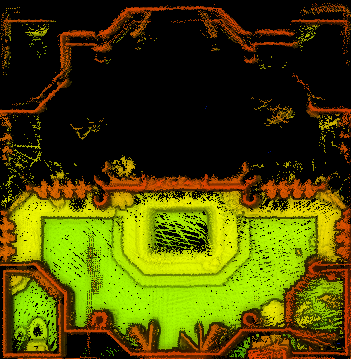 This effect is seen whether the lidar is horizontal or tilted. When horizontal, the drift and twisting occurs along the z axis. When the lidar is tilted, the drift appears along the axis of movement. This may be x, y, or a combination of the two depending on the direction of movement relative to the pitch/tilt angle of the lidar. Bottom line, this causes incorrect registration resulting in shortening, lengthening and twisting as can be seen in the figure to the left.